Sometimes there would be 15 players on a team, all of them on the ice at the same time. Stickhandling through the mob was like navigating the Mall of America in late December. “And if someone else showed up, they would just get thrown on one of the teams and start playing,” said Aaron Broten, a fixture at hundreds of those shinny games in Roseau’s fabled North Rink. Broten’s hockey upbringing didn’t involve a lot of structure. Boot hockey games in front of his house were the preferred alternative when the rink wasn’t available for those all-comers pick-up games. Of course, in Roseau, the North Rink is legendary for always being open. 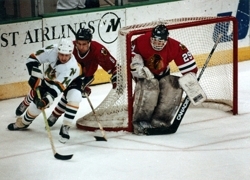 Broten’s competition growing up was world class. Bryan “Butsy” Erickson, who lived two houses down from Broten and was a year older in school, often remarks he was the “third-best player in my neighborhood.” Erickson had a brilliant career at the University of Minnesota (238 points in 144 games) and played 10 years in the NHL. Broten’s older brother, Neal, also was a grade ahead in school. Aaron said he squared off against his older brother in most every sport imaginable. 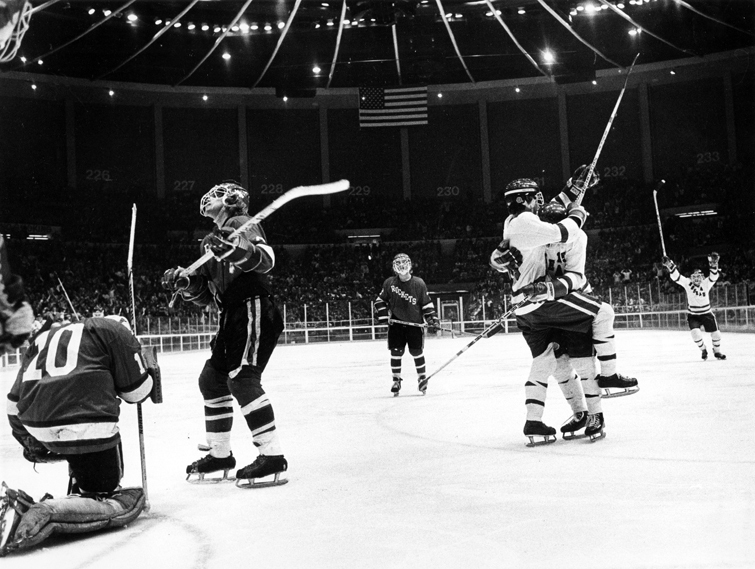 In 1978 the Brotens and Erickson formed what is believed to be the highest scoring line in state history. Despite sitting out the third period of seven or eight blowout victories, the trio amassed exactly 300 points in 26 games. Roseau was 23-0 heading into the state tournament, where the Rams beat defending state champion Rochester John Marshall 4-2 in the quarterfinals behind two third-period goals from Aaron Broten. 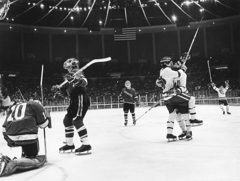 Roseau was upended by eventual champion Edina East 5-3 in the semifinals of the 1978 state tournament in what was a most painful case of déjà vu for the Rams. Roseau also was undefeated when it reached the 1977 state tournament, only to lose 2-0 to Edina East in the quarterfinals. “They are good memories,” Broten said about Roseau’s state tournament appearances. “But there was some disappointment in the fact that two of the better teams in the history of high school hockey went down undefeated and didn’t win a state tournament. 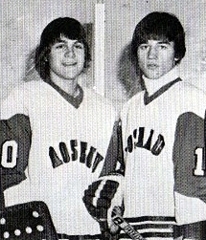 Erickson and Neal Broten, who went on to win NCAA, Olympic and Stanley Cup championships, graduated after the 1977-78 season. Operating with two new linemates, Aaron Broten posted a stunning 43 goals and 88 assists for 131 points as a senior. More amazingly, he missed several games that season to play in the World Junior Championships and because of illness. With Broten scoring seemingly at will, the Rams again reached the state tournament. Broten scored two goals and added two assists as Roseau upended previously unbeaten Grand Rapids 6-4 in the quarterfinals. Once again, Roseau faced Edina East in the semifinals. For a third straight year, the eventual state champion Hornets emerged victorious in a wild 12-4 shootout. Broten assisted on three of the four Roseau goals. In the consolation championship, Roseau outgunned Irondale 9-7. 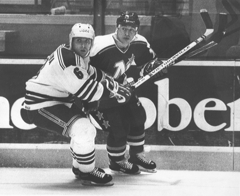 Broten had four goals and an assist, giving him a tournament-best 12 points. He finished his career with 269 points, the seventh-highest total in state history. Broten’s 88 assists as a senior is the state single-season record. “We still had a good team, and I had good people around me,” Broten said about his senior season. “It wasn’t like we were abandoned. Broten followed his two former linemates to the University of Minnesota. 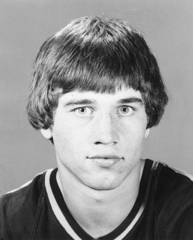 In his two seasons with the Gophers, Broten scored 72 goals and 106 assists for 178 points in 86 games. Broten scored 106 points as a sophomore in one of the greatest seasons in Gophers history. He played in 748 regular season NHL games during a pro career that spanned 12 seasons. Broten spent most of his career with the New Jersey Devils, where he had three 20-goal seasons. Broten, who retired from pro hockey in 1992, lives in Roseau where he works as an investment advisor for Investment Centers of America. He has been active in the town’s youth and high school hockey programs, and has served as both the head coach and as an assistant for the Rams in recent years.